Use these guidelines to see if your sump pump needs to be looked at by a professional plumber. The constant rain of the spring season helps bring nature back from the dormancy of the winter. We all love to see nature in full blossom, but some homeowners may feel a tinge of worry. All of that rain has to go somewhere, and many people rely on sump pumps to ensure that that water doesn’t end up sitting in their basements. 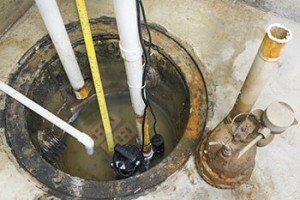 If the sump pump fails, basement flooding can result, causing serious problems. So how can you tell whether your sump pump is about to fail? Recognizing these signs and getting them addressed quickly could save you some big headaches later on. A sump pump that is working well operates so silently you shouldn’t even know that it’s there. So if it is making a lot of noise, it’s not a good sign. Generally, though, a noisy sump pump may only need some repairs to get it back into working shape, so calling your professional plumber for a repair visit will usually be all that is required to protect your home. This is especially noticeable during the rainy months of early and mid spring. Your sump pump should be working and removing water during long rain events. If it is failing to remove water, it may indicate an overloaded system or a failing sump pump. Your plumber may also recommend taking additional steps, such as replacing your sump pump with one of a higher capacity or installing a backup. Perhaps your pump is working, but it seems to be running all of the time or is removing water very slowly. Just as with any home system, sump pumps require basic maintenance every so often to keep them running at peak performance. Have a technician come out to check out your system. They should notice whether the sump pump needs some TLC or a little backup to keep your basement free of water. This entry was posted on Thursday, April 27th, 2017 at 7:11 pm. Both comments and pings are currently closed.